The Centro Culturale di Milano (Cultural Center of Milan) was founded in 1981. 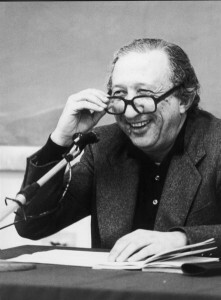 A group of students and young scholars of University of Milan took seriously a desire and a proposal of don Luigi Giussani (who followed the Center’s work till his last years): “to embrace the world, discovering the beauty and the strain of the human experience in its research of the truth and to live through the passion for man originated by the Christian faith, showing to everyone the pertinence of Faith with Life”. At the beginning the Center’s name was “San Carlo” and the location was in Corso Matteotti. The Eighties were marked by the meeting with Giovanni Testori and Augusto del Noce. Straight after important artists, men of science, philosophers, writers from Italy and abroad have compared their experience with such cultural novelty. The beginning was also signed by the stream of dissidents from Soviet Union and Eastern Countries through the association Russia Cristiana and by the close relation with Meeting of Rimini “for the friendship among peoples”. At the beginning of Nineties – while Milan stopped under the coups of justicialism – the Center changed both the name in “Centro Culturale di Milano (Cultural Center of Milan) and the location too, moving in Zebedia Street, n° 2, an ancient place in the historical center of Milan, near Milan Cathedral, mentioned by Maggi, where – as to the historical literature’s writer Dante Isella – the intellectual circles used to meet at the end of Eighteenth century. The Centro Culturale di Milano enlarges its boundaries: persons, groups from all over the world that recognize one another for their common desire and research of the truth and thanks to internet put themselves in touch passing through Milan. So it begins the study and the attention to life and to Milan restarting; the School of Creative Writing “Flannery O’ Connor” starts off with Luca Doninelli and Giorgio Pontiggia and moreover the Home of Poetry, the systematic meeting with the Jewish world, the prophetic knowledge of Islam and the islamic question, the historicity of the Gospels and of the Christian documents, the exhibitions and the Exercise Books of Photography, the dialogue with the Italian and European laymen, the partnership with Milanese institutions, universities, editing houses, theaters, and together with the Italian Cultural Centers Association the coordination with more than 70 Cultural Centers. So it unwinds the original research and meeting, but always remaining ourselves, between the grown-ups “knowing how to speak” and the young people “knowing how to listen to”. The Center becomes meeting point of personalities becoming after members of the Center and stage for lectures deeply leaving their mark on our time: from Hans von Balthasar, Emmanuel Levinas, Czeslaw Milosz, John Eccles, Andrej Tarkowskij, Chaim Potok, Antony Burgess, Federico Zeri, Mario Luzi to David Grossman, from Alain Finkielkraut, Jean Clair, Joel Meyerowitz, John Polkinghorne, Ugo Amaldi, Carlo Rubbia, John Barrow, Paul Davies, Laurent Lafforgue, Remi Braque, Joseph Weiler, Aharon Appelfed, Samir Khalil, Riccardo Muti to Rami Bahrami and more than 2500 Italian and international authors, writers, lecturers. The simple and passionate work of young students and professional men and women devoting free part of their time and life, not only but also the cooperation and the network of associations, magazines and institutions (i.e. Euresis, Admira, Medicine and Person, Foundation for Subsidiarity, Trails of Cinema, Theater “Fontana”): this is the pecularity and the strength of the Center’s life. Culture can only be originated by passion for life. And passion for life is that cognitive and affective emphasis emerging from a definite idea of existence and from a definite judgement on life value. From this the Centro Culturale di Milano starts again every time in order to know, to meet and to stirr up everyone who desires to look at the reality in such a way. It’s not only learning’s capacity. It’s rather the result of a full awareness of the fondness of the experience we are living inside such reality and inside the history. And this is more perceived today, owing to the great uncertainty and confusion we have to notice constantly. It seems that only the category of impossibility – the one that admits only the end and the mere nothing of things, the uselessness of reality – finds citizenship. The culture, in fact, is a showcase of abstract and evasive ideas and concepts considered as diversions, that hold in no esteem the whole horizon that marks the human heart and that are not up to the hope for which such heart calls. Our presence in the cultural life has a different facet, able of enthusiasm. We have to recognize, on the contrary, that the dominant mentality is hostile to the assertion of a cultural position, when this one expresses itself as a critical and systematic experience of the whole reality; to the catholic culture it’s at most conceded a certain benevolence towards spiritualism, till it is hanging in an abstract dimension. But such benevolence can provoke great misunderstandings: we cannot be silent on the fact that, sometimes the catholic culture has, perhaps unconsciously, favored a compromising relation with the secularist culture. The rabbi of Jerusalem, David Rosen, during the Meeting of Rimini has clearly declared that any truthful dialogue is possible only if the conversation partners start from the conscience of the differences of their ideal positions. The careful look to the Christian experience and the awareness of the difference and non-involvement of our place make paradoxically more powerful the meeting and the appreciation of the other, without feeling anybody as an enemy, but in relation with everyone as testified by the numerous relationships, meetings, cooperations happened during the various Center’s activities. The culture must be able to offer everyone the meaning of everything. The truly cultured man is the one who has reached the possession of the connection that binds one thing to another and everything among themselves. Culture, therefore, cannot be only possession of knowledge, because knowledge resulting from the study of thousands of men couldn’t even say a single resolutive word concerning the mystery about the relation that binds man to everything, i.e. about the sense of his existence. Therefore the origin of everything – that is the last sense of everything – has revealed itself to human beings. The Centro Culturale di Milano gets 5 x 1000. 5 x 1000 doesn’t substitute 8 x1000. The Centro Culturale di Milano is a Social Promotion Association and benefits from tax deduction for donations in full. The Law by Decree n. 35/05 provides new facilities for the donations to Non-Profit and Social Promotion Associations as CMC. The donations and the liberal money allocations from natural persons and from enterprises to CMC are deductible in full from Income Tax Return (in the measure of 10% of the total income, but not over 70.000,00 euro). The Centro Culturale Milano (head office and Verri Room) is situated in via Zebedia n° 2, Milan, within a stone’s throw from Missori Square and a short way away from Milan Cathedral, in the original historical Roman and Medieval Center of Milan, in an ancient complex of eighteenth century buildings comprising Arcimboldi’s School and the Baroque Basilica of Saint Alexander. The head office of CMC was the site of the intellectual and literary Circles of Eighteenth/ Nineteenth centuries. From 1981 up to now the Center has been stage of meetings with men of science, poets, writers, Nobel prize winners, philosophers, economists, artists, musicians and witnesses of our Age. Verri Room of CMC has maintained the ancient architectural style with the vaulted roof and the original stuccos. It is the ideal place (110 seats) for conferences, lectures, work meetings, exhibitions (catering, recordings, projections are possible too). Thanks to a well-established experience CMC can offer technical assistance and efficient careful services during the whole period of the event, from beginning to end. The room is at complete disposal all day long and can be used also during week-end.